One of the benefits of going home to visit family (other than getting to see my family of course) is I get to learn what new and exciting things my super speedy runner cousin has been up to. Well other than letting me ride his Elliptigo, (so much fun!! ), my cousin shared with me a few awesome fitness websites, a few new books, and a little info on nasal breathing. Question: How do you breathe when you run? It’s not something I typically think about either but based on my running pics, I can say for a fact I breathe through my mouth and not my nose. Mouth open, oxygen in, aerobic glycolysis starts, and I keep running. It’s what comes naturally to me, right? Well I did a little reading after my information session with cousin Dan, and it seems breathing through the mouth is in fact, not natural. Infants breathe through their noses and it is only when something prevents them from nasal inhalation, that they open their mouths. It’s an emergency response. and the most common thing I read about nasal breathing… it’s hard! Yesterday I tried a little nasal breathing during my run. Other than feeling like I was blowing snot everywhere (sorry, gross I know), I felt like I was suffocating . I was only able to get up to six breaths at a time before I had to open my mouth. But I did notice a little increase in pace. That was probably because I was at the end of my run, but maybe a little nasal breathing helped. Today I have a hard speed workout so I doubt I’ll be trying my nasal breathing at the track. Perhaps I’ll save it for my easy run tomorrow. Running Update: Last week I ran 45 successful miles. I had two speed workouts, one at the track and one tempo run, and they both went very well. This week is my low mileage week so I’m enjoying a few shorter days. And Friday will be my long run day because we are leaving for San Francisco on Saturday. So excited!! Yesterday’s run is here. For the next seven months, I’ve vowed to treat myself like the runner I know I can be. It’s fun to think about and as I mentioned earlier this week, the next few months are all about massive base building and strength training. In the meantime, since I’m still not running, I’ve been able to get quite in tune with my body. Due to the fact I don’t have the beautiful outdoor scenery to distract me, only the same people I see every day at the gym, I’m focusing a lot more on exactly what I’m doing with my body when I move. The most important thing I’ve learned? My muscle memory is whack! Muscle memory can best be described as a type of movement with which the muscles become familiar over time. Muscle memory thus becomes an unconscious process. The muscles grow accustomed to certain types of movement. 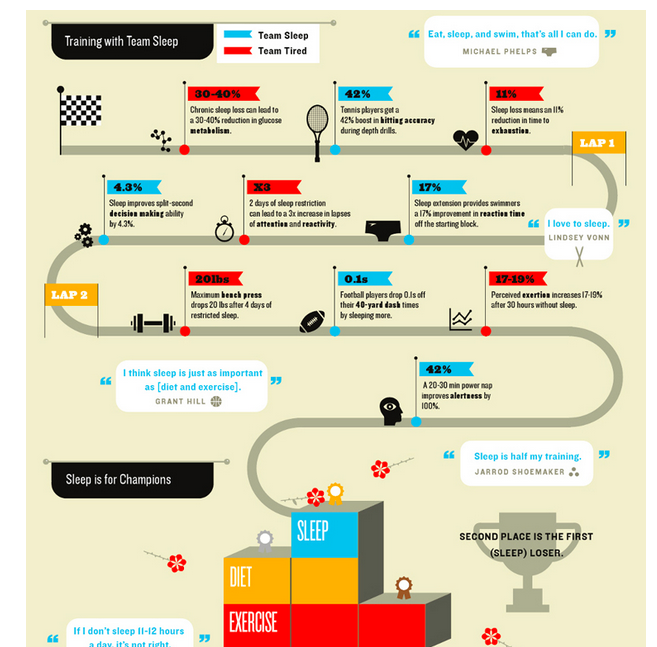 This is extremely important in different types of training for sports. The more often you do a certain activity, the more likely you are to do it as needed, when needed… This is one of the reasons that with many activities that involve the body’s muscles, like playing an instrument, learning appropriate technique is always stressed. You want your muscle memory to reflect the correct way to do things, not the incorrect way. Your muscle memory can actually play against you if you’ve constantly been practicing something the wrong way. The key to building good muscle memories is to focus on the quality of the quantity. Recovery Update: My legs are still quite sore from the hip flexor strengthening exercises I did on Tuesday. However, I can tell the strength training exercises I’ve been doing are helping me to sit up straighter, engage my hip flexors, and open up my back. The overhead lunges are my new favorite exercise. I’m also starting to keep a record of all the exercises, stretches, workouts, foods, etc. that work well for me. I need to remember how these exercises make me feel and why they are beneficial for my running. If not, I’ll soon be back to where I am now. Injured. Yesterday I watched this video of Ryan Hall discussing his new running coach – Renota Canova. I had never heard of Canova so I did a little research on him tonight. It turns out he’s coached quite a few very successful marathoners and has a very specific approach to training. In other words extensive hill work, circuits, increasing the intensity of amount of hard running, with great differences in intensity between hard sessions and recovery days. Running Update: Today was an easy 6 miler. I ran a different route and incorporated a few more hills. I also had to go sans music because I desperately needed some quiet time. Nothing super excited but here are my stats. Tomorrow is my longest track workout to date. Although I have not been doing a good job of listening to my favorite podcast, Ben Greenfield Fitness, I am at least still able to follow his blog. I was reading this post today, and his mention of adaptogenic herbs reminded me of how MUCH he talks about them. 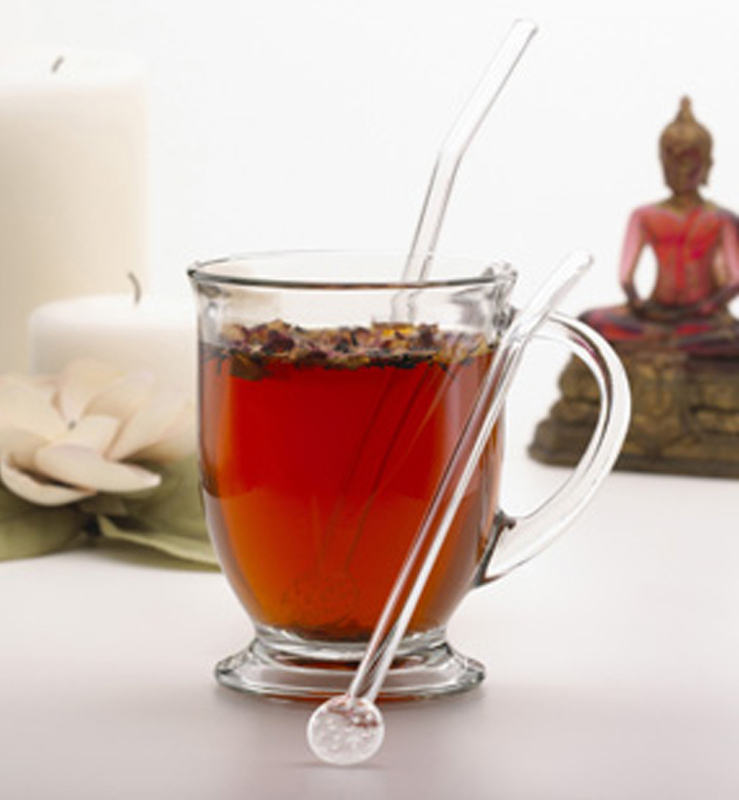 He always mentions his adaptogenic herb tea on his podcast and also includes them in his blog posts occasionally. I finally had to ask myself today, What are adaptogenic herbs? These herbs are known to have a global impact on the body and to prevent aging. They are Pamax, ginseng, Siberian ginseng (eleuthero), rhodiola, ashwagandha and Holy Basil. These herbs, also called companion adaptogens, are used specifically to support the immune system of the cells and to prevent degenerative diseases. They include turmeric, green tea, rosemary, grape seed (proanthocyianidin), grape skin (resveratrol) and ginger. These herbs target specific issues and include licorice and fo-ti (for energy and sleep), gotu kola (for connective tissue), ginkgo biloba (for circulation) and royal jelly (for mental alertness). Running slow applies “gentle” stress to the key physiological systems required to run at a high level. Gentle, easy running helps to let the healing begin. Think of it as “active recovery” that helps facilitate blood flow gently to the damaged muscles that need help. Independent of expediting the healing process, running slow is the most effective way to build a base. There are a million different training philosophies and approaches that you can utilize to get into quality running shape. Virtually all of them include some kind of base building phase comprised largely of easy runs. This blog entry from The Lola Papers does a great job of summarizing the slow recovery run – it’s for recovery. No race and no competition. The author describes the run as a vacation, a siesta of sorts. Just giving your legs a break while still doing what you love. On a side note, today was the first day back for the students. I have 90+ students and I can already tell they’re fabulous. I wholeheartedly believe that when given the opportunity and in the right environment, kids really do want to excel. Here is to a great school year! First I would like to give a huge THANK YOU to the two girls selling lemonade along the Tobacco Trail this morning. If it weren’t for them, I’m sure I would have slowly been walking back to my car. You see, it was hot today and I didn’t refill my bottle with enough fluids. Therefore, around mile 17 when I was about to run out of my GU electrolyte drink, I thought I might start begging strangers for water. 🙂 Luckily two sisters along with their mom were selling lemonade and cookies at mile 17.9. Although I didn’t have any money with me, they filled up my bottle with the coldest, most delicious lemonade ever. I immediately felt like I came back to life and when I got to my car, I drove back to where the girls were to pay them. They’ve got a good thing going and I’m going to start carrying a little cash with me from now on. Next time I might want a cookie! Blue lips may represent a type of cyanosis caused by a lower level of circulating oxygen in the red blood cells. It may also represent a high level of an abnormal form of hemoglobin in the circulation. If normal color returns upon warming and/or massage, the cause is due to the body part not getting enough blood supply due to cold, constriction (of the tissues or the blood vessels that supply the tissues) or some other reason. If the lips remain blue, then there may be an underlying disease or structural abnormality interfering with the body’s ability to deliver oxygenated red blood to the body. If you are experiencing symptoms such as blue fingers, fingernail beds, lips or skin when you exercise or overexert yourself, this could be a sign of a serious medical condition. If you have a pre-existing medical condition which affects your oxygen levels, you may notice the bluish tint, which is called cyanosis. If you look in a mirror, you might also notice that you look paler than normal. Your lips might even look blue because of the cold and exertion. In general, you don’t have to worry about cold hands and feet and even blue lips at the end of your run, as long as you feel fine otherwise. For me. I’m going with my blue lips are due to dehydration. As Dr. Timothy Noakes suggests, drink to thirst. Well I was super thirsty and had nothing to drink. Therefore, I was probably a little more dehydrated than I should have been. Perhaps lack of oxygen might have something to do with it also, but I’m not sure how to determine that one. Either way, I feel fine now so as long as they keep returning to a normal color, I’m not going to worry too much. 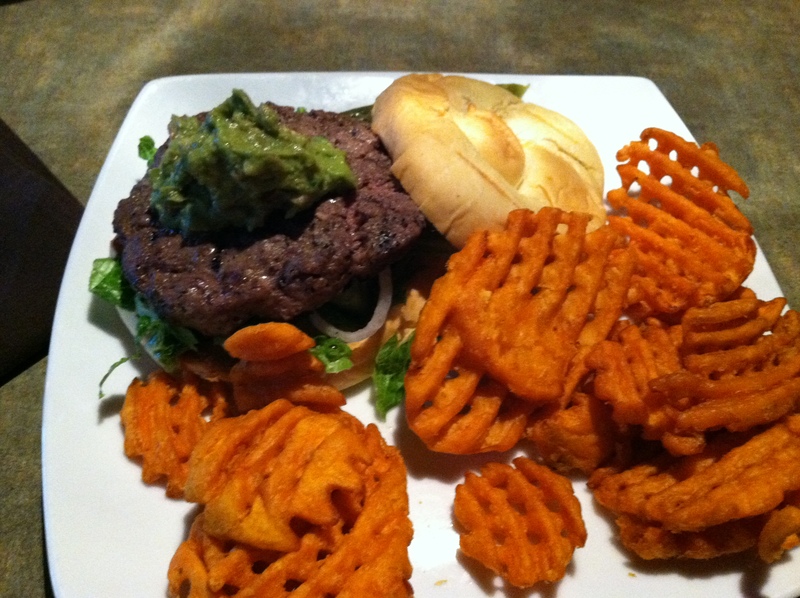 And check out my delicious lunch this afternoon: An organic bison burger with guacamole and sweet potato fries. It was amazing! I ate every last bite. Yum!